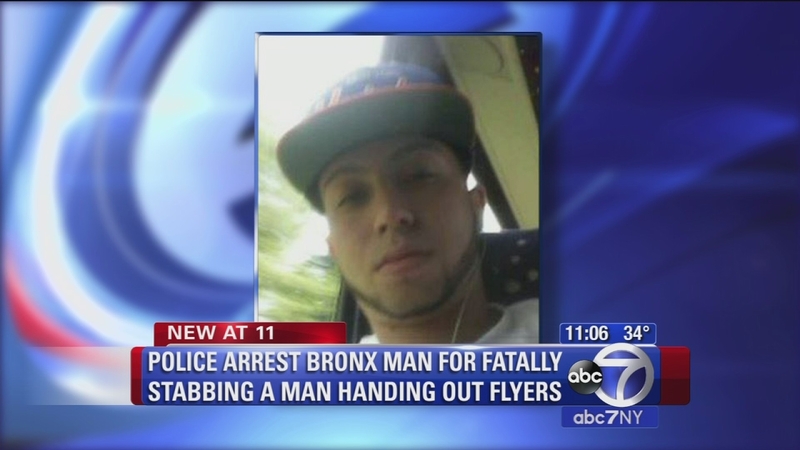 FORDHAM HEIGHTS, Bronx (WABC) -- There is an arrest in the senseless murder of a man in the Bronx. A minor dispute ended in a deadly stabbing. Police say 54-year-old Eric Ortiz stabbed 27-year-old Christopher Cabrera in Fordham Heights earlier this week. They say Ortiz and Cabrera both distributed flyers for a cell phone store. He apparently didn't like the way Cabrera did his job. "He was an intelligent child all his life, and now he left a child of 8 years old," said Carmen Santiago," the victim's mother. Cabrera's mourning family says he was going to turn 28 in May.